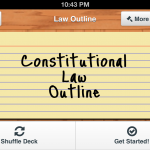 Pass the Bar with the Constitutional Law Outline app! 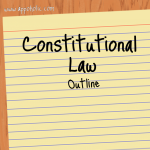 Constitutional law defines the relationship between the different entities within a government – in the U.S. this is the executive branch, the legislative branch, and the judicial branch. Supplement your law school studies and programs like Kaplan which costs thousands of dollars with flash cards to better learn and apply Constitutional Law concepts. 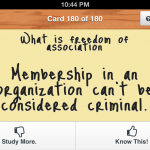 * Flash cards and outlines take hours to write by hand – instead spend that time studying. * Works on iPads, iPhones, and iPods (Touch) as old as version 4.3, so you can study wherever you are with whatever device you have. * Having the answers hidden on a different side improves our memorization of topics. * No Internet, No problem – works offline!